On the lake are being tested for underwater optical modules telescopes that help scientists to detect neutrinos. According to the researchers, these mysterious microparticles contain information about what is happening in the most remote corners of the universe. A unique project called "The Baikal neutrino telescope." Neutrino - a neutral particle moving at the speed of light. They are formed during nuclear reactions in nuclear reactors or in the atmosphere. Until recently it was thought that their weight is zero. They are difficult to study because they have very small cross section of interaction with matter. Why it decided to conduct trials on Lake Baikal? The fact that there can set the telescope so that the field of his "vision" will get the most interesting space objects. Officer of the Joint Institute for Nuclear Research, Igor Belolaptikov believes that Russian scientists are much more likely to get information about the neutrino than their American counterparts, have set their telescopes at the South Pole. "At the South Pole setting can only look in one direction, and we can look absolutely different. And the most interesting objects in the universe, the brightest, just located at the point at which we can watch "- he explains. To get to the telescope to overcome dozens of miles across the ice of Lake Baikal. The device looks like a frail-looking ball, which, however, able to withstand water pressure at a depth of one mile. Inside the ball are a special device for neutrino detection and a photomultiplier. If testing is successful, it will begin mass production of modules. Incidentally, for the Baikal telescope to take more than two thousand pieces. But no less interesting for researchers and Baikal itself. For example, in 2008-2010 was International research expedition "Worlds" on Lake Baikal, during which they committed multiple dives into the lake on deep-sea vehicle "Mir-1 and Mir-2". The project cost more than 6 millions of dollars. It was funded by an investment company Metropol, through the Fund for Protection of Lake Baikal. led an expedition scientist-oceanographer, Doctor of Geographical Sciences Arthur N. Chilingarov. 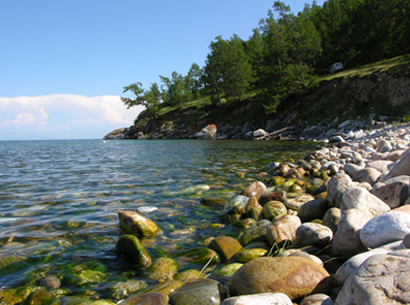 Its objective is to study various natural processes occurring in the lake environment, the search at the bottom of Lake Baikal useful minerals, as well as archaeological artifacts. soil and water in different places, found out the natural sources of hydrocarbons and gas hydrates, hitherto unknown to science, living organisms - for example, a blue sponge. It turned out that the place where the oil comes to the surface, a very rich fauna - there is found a lot of fish, crustaceans, molluscs ... Apparently, animals adapted to this environment. Perhaps even individual organisms feed on oil and hydrocarbon breathe. A few years ago in the Circum-Baikal railway were indeed found the remains of a railroad car during the Civil War. However, due to the sudden deterioration of weather to continue searching if not found. But during the expedition of the "Worlds" Baikal "just at this point in the water were found some shiny objects. There also were rumors that this is the legendary gold Kolchak! However, this proved to just a ceiling with gold leaf. Alas, although the water of Lake Baikal, and is very clean, the bottom of the still sometimes catches debris, including crockery and other household items ... As for the car with gold bullion, has fallen into the lake, then it's likely just a beautiful legend. Thailand shakes because of Japan?